Have you ever gone fishing in your canoe or kayak and had the tiresome task of paddling while trolling for fish at the same time? Not only is this a grueling job, but it can also prove to be mechanically demanding and the extra movement can scare off some fish in the process. To solve this problem, you can have an electric trolling kayak motor installed on your kayak or canoe. 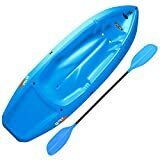 A kayak electric motor contains a motor, propeller, and controls, and is designed to be attached to either the bow or stern of an angler’s boat and lift out of the water when the main engine is in use to prevent any drag from occurring. The purpose of this article is to aid you in finding the best trolling motor for kayaks. Once you get the best kayak trolling motor installed on your boat, fishing will become so much more enjoyable and relaxing, and you will wonder why you did not do it sooner. Let’s take a look at the best trolling motors for kayaks you can buy today. 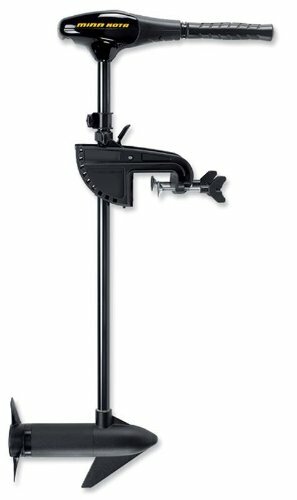 This 12-volt transom-mounted, freshwater motor has a thrust level of 30 with a 30” shaft, and it comes complete with a six-inch telescoping handle. There is a lifetime warranty on the indestructible composite shaft while the motor carries a two-year warranty. This has a cool, quiet power, which enhances the batteries’ maximum lifespan and does not scare off the fish. In order to maintain the most control, it has five forward and three reverse speeds. It also boasts an ergonomic speed control tilt twist tiller and a rock-solid mount for the steering lever lock bracket. This trolling motor has an average of 4.5/5 star ratings on the 682 customer reviews received. The Newport Vessels trolling motor has a 5-LED battery meter, which will give a complete reading of the life of your 12V marine battery (battery is not included). 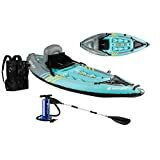 It has a 55- pound thrust and a 30-inch shaft that is built of composite fiberglass, which is extremely durable, allowing for an appropriate position in all depths and water conditions; the quiet power and long battery life will also allow you to fish all day long and not scare away the fish. The Newport Vessels is not just quiet and cool, but also versatile. The material is a stainless steel hardware that will hold up well in saltwater as well as freshwater. There are eight speeds (five forward, three reverse) and a six-inch telescoping handle. This has an ergonomically controlled handle, which allows for a ride that is smooth and easily controlled. It is also equipped with a stainless steel, zinc, and magnesium hardware amp that draw 52 amps; this ensures effective trolling in freshwater or saltwater alike. This comes with a complete backing within the industry for excellent customer service, which allows for a full two-year warranty on all products made that carry the Newport Vessels brand name. 315 customer reviews do not lie about the excellent customer service and reliability of this product; this trolling motor has an overall rating of 4.5/5 stars. The Cloud Mountain trolling motor is tough and dependable. This has a reinforced nylon bracket, which guarantees an elevated durability, resistance, and stabilization. Its all-aluminum head augments the service life of the motor. This also features a convenient battery display and an ergonomic adjustable handle that matches the height of any user. It has 8 speeds – 5 forward and 3 reverse – to allow for the smoothest and most controlled ride. This versatile motor has a 28-inch composite shaft made of fiberglass, which allows for a high-powered resistance to decomposition and a correct placement in various water conditions. The shaft can be positioned from a seated position as an added bonus. Additionally, the motor has all stainless steel hardware, making it an excellent trolling motor for kayaks in saltwater as well as freshwater locations. The motor’s 10-point LED battery indicator is an excellent feature, allowing you to see how much battery power is remaining and how much electricity is being consumed (however, the battery is not included). This had 50 customer reviews and an average rating of 4/5 stars. If you’re looking for a dependable, affordable, and easy-to-use motor, this one meets all the criteria. A dependable motor for most fishing boats, kayaks, inflatable kayaks, dinghies, tenders, etc. 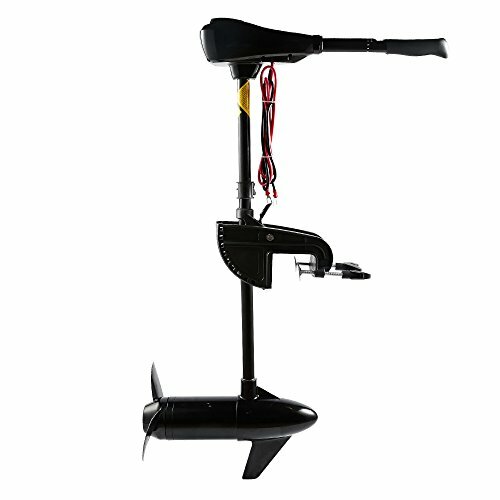 The Goplus Motor has a six-inch adjustable handle; this enables better control while trolling in freshwater areas. You have all the control right at your fingertips with 8 speeds– five-forward and three reverse. Even underwater grass and marsh is not an issue with this because of its exceptionally designed three-blade propeller, which ensures that you can have easy, smooth movement. The GoPlus trolling motor is strong and reliable, with nylon brackets that are reinforced to ensure the highest strength, ablation resistance, and stability in dimension. The composition shaft is constructed of fiberglass, ensuring the highest tensile strength and resistance to corrosion. Additionally, an aluminum head assures the long life of your trolling motor. This has a 10-point LED battery indicator, which displays battery life and electricity use and allows you to protect your batteries. 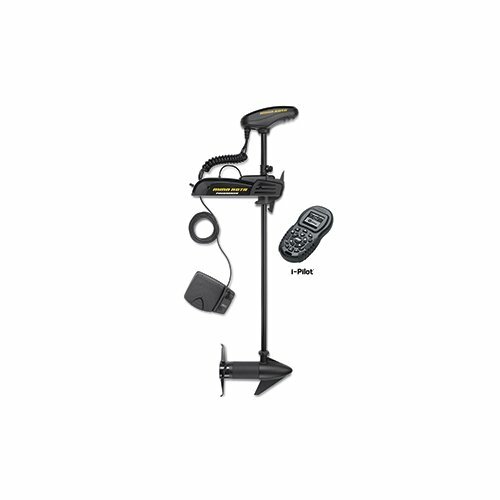 The Minn Kota PowerDrive 70 motor comes with a remote control (no foot pedal); 24 volts of power, 70 pounds maximum thrust, and 60-inch shaft– this composite shaft is indestructible. It flexes on impact, and will not break, kink, or corrode. The motor runs cool and quiet, with an extra wide opening and commutator, which allows the heat to dissipate; this results in the motor running much cooler, which provides an overall increase to the life of the battery. There is also a reduction to the amount of friction created, which in turn reduces the noise level, making it less likely scare off the fish. The Minn Kota PowerDrive 70 also has i-Pilot, Universal Sonar 2, and a variable speed control. The autopilot is also included with the i-Pilot. The GPS-powered i-Pilot allows you to easily control speed and steering, record paths, and communicate through Bluetooth. In addition, this has forty-two maximum amps, and a Weedless Wedge 2 propeller (MKP-32). This propeller pushes away the weeds and other brush without draining power from the battery. The Weedless Wedge 2 has such attributes as swept back, flared blades, which provides an unrelenting propeller activity. This brand of Minn Kota kayak motor also comes backed with a two-year warranty. The Watersnake Venom Swet electric motor has the following elements available such as Swet54/42, a 54 pound thrust ability, 12 volts of power, and a 13-54 minimum/maximum amps drawn, and a white salt water motor. The Watersnake Venom electric trolling motor highlights a digital voltage and an alloy transom bracket that is adjustable. This trolling motor also comes with eight-speed capability–three forward speeds and two reverse speeds. There is also telescopic tiller control, a sturdy composite shaft, zinc anode, a three-blade weedless propeller, a 42-inch shaft, and a propeller shaft that is constructed of stainless steel. The Haswing Protruar transom electric kayak motor has implemented its own specific take on a brushless technology; it has a longer service life, cooler operations, and a diminished motor usage. The design and structure of this also means that little to no maintenance is required. This allows for an easy, efficient fishing experience. You can dial up the appropriate amount of control and speed required for efficient fishing. Therefore, the quantity of time you require for fishing can be dialed up accordingly, allowing you to fish all day long. The Protruar Transom electric trolling motor also has an ergonomic handle that allows you to raise it up or change directions while fishing. The folding handle allows it to be changed up and tilted up to 100 degrees while fishing. The height of the Protruar 110 LBS can be easily changed in or out of the water; you can also easily change the tilt degree of the handle to make it more comfortable for all-day use. The Protruar 110 LBS can be tilted in or out of the water to accommodate the change or depth in fishing conditions or the change in shaft height. The height of the shaft is completely changeable with one lock; this is so the motor can be quickly deployed in practically any water. In addition, the Protruar 110 LBS can be utilized with a variety of boat transoms at different heights. The Protruar 110 LBS has a prop-clutch that is made to automatically shut off the propeller to avoid damage to the motor whenever it has some weeds, fishing line, reef, or anything else entangled within it. To aid and preserve safety, there is a kill switch installed on the throttle; when this emergency switch is pulled, it automatically shuts down. The Protruar 110 LBS has a 35.5 inch aluminum alloy shaft; however, different heights of shafts can be used, with the most common one being 25.4 inches–this is the perfect height for kayaks, dinghies, tenders, fishing boats, inflatable boats, as well as most transom boats. The Protruar 110 LBS can be easily adjusted while the user remains seated; it is also lightweight and simple to handle and has a LED Power Reader, which permits the operator to check the power of the battery at any time. This allows you to be able to plan your fishing trip accordingly and ensure you have enough battery power to troll for fish as you see the need to. Having a good trolling motor can make the sport of fishing even more fun, it allows you to catch bigger fish and more of them, which enables you to have more fun when out fishing. A lot of people do not realize they need a trolling motor to fish; large boats have noisy motors that scare off the fish, and their motors are not made to idle at a low, consistent speed. For this reason, you will need a trolling motor, which runs a lot quieter than the standard motor on a boat. This buying guide for trolling motors is going to provide you all the information you need to determine which trolling motor is best for your needs. There are seven examples of some excellent boats in this buyer’s guide. However, there are a lot more trolling motors out there; to help you make the best purchase for you and your boat, we’ve provided this buyer’s guide and list of frequently asked questions to help you find exactly what you’re looking for. The electric trolling motors in this buying guide are made of stainless steel aluminum alloy; which is a very heavy-duty material. These trolling motors are made to last and are indestructible. Constructing these trolling motors out of stainless steel is an excellent way to prevent corrosion, whether you are fishing in saltwater or freshwater. 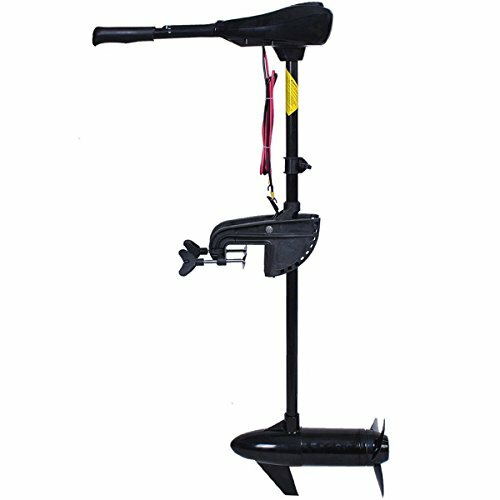 When you buy a trolling motor, you want it to have the maximum thrust power that your fishing boat or kayak can handle. Thrust comes in the following: 36, 40, 46, 50, 55, 60, and 86 pounds. When you’re purchasing a trolling motor, you will want to consider the size of your boat and the conditions you may be fishing in to decide how much thrust you need. 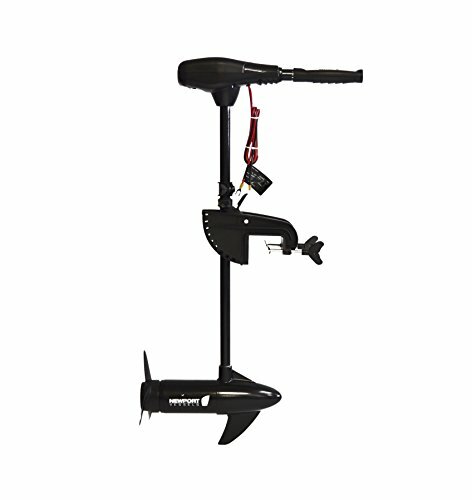 Electric trolling motors in this buying guide operate on a standard 12V battery. Many come with an LED battery light tester that allows the user to know how much battery power they have remaining without the battery dying. It is critical that you have a battery power life indicator; you would not want to get stuck out on the water with a dead battery just because you were not aware that the power was getting low. The trolling motors in this buyer’s guide have eight speeds: 5 forward and 3 reverse. As a buyer of one of these trolling motors, you should look for a motor that operates efficiently on all forward and reverse speeds. The majority of these trolling motors in this guide can be used in freshwater or salt water. These have the ability to tilt easily in and out of the water. In concluding this buyer’s guide, the above electric trolling motors are the top seven models on the market today. Each has the sufficient speed, battery life, and propeller power to make your fishing trip easier and more enjoyable. Q. How do I convert thrust to horsepower? A. A common misconception is that the more pounds of thrust you have, the faster the boat will go. But when it comes to trolling motors and outboard motors, the speed of the boat is dependent on the horsepower and propeller pitch. When the prop pitch is altered, you trade it for top speed. Q. 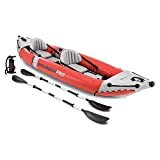 How important is the selection of a battery for an kayak motor usage? A. A vital part of your motor system is the battery. Therefore, when choosing a battery for your electric motor, you should choose a deep cycle marine battery of superior class. Unlike automobile batteries, the deep cycle marine batteries are made to run to a discharged state and then be recharged. For optimum results, you should re-charge the battery on your trolling motor after every use. Q. What type of battery is needed for my trolling motor? A. A 12-volt, 50 Amp hours, deep cycle marine battery is the type of battery that is recommended for a trolling motor. Q. How many 12-volt batteries are needed to run my trolling motor? A. For a 36, 46, 55, and 62 pound thrust motor you will need one 12-volt battery; an 86 pound thrust motor requires two 12-volt batteries. Q. Can my kayak trolling motor be used in saltwater? A. Yes. A trolling motor that is made of stainless steel and zinc hardware can be used in saltwater. Q. Can I run a 24-volt motor off of a 12-volt battery? A. Yes. However, even though it will not damage the motor to do this, it will significantly affect performance. Q. Electric power ratings are in pounds of thrust; therefore, how do I determine the thrust requirements for my boat? A. The size and weight of your boat determine the amount of thrust needed. When you select a motor, a good rule of thumb is to select two pounds of thrust for every 100 pounds your boat weighs when completely loaded. If you often fish in areas of high winds, rivers, or other weather conditions that are adverse, then you will want to buy a higher thrust motor–it is always a wise choice to have too much power rather than discover later you do not have enough! Q. Do the LED lights on the trolling head remain lit all the time? Does this run down the battery? A. The LED lights do remain lit; however, they have little effect on the life of the battery.